Yay! The back porch is finally done! Phew. This project had me close to tears because it was so much painting. Ugh. It took three coats of Cabot white stain on the woodwork, two coats of Valspar paint/primer on the brick, and two cans of Valspar Exotic Sea Spray Paint on the shutters to get the look I wanted. But in the end…it was all worth it! In my rush to get this baby done I forgot to take a good “before” picture for you. Gah! However here is a before and after of the main porch area. The brick was previously painted red and the entire porch and latice were unfinished wood. And here is what it looks like now! I am in love with it! The first thing I needed to do before I could paint was to clean! We used a deck cleaner on all of the wood and on the window and door moldings we used Mr. Clean Outdoor Pro and and Outdoor Magic Erasers. I wasn’t a fan of the “old man aftershave” smell of the outdoor spray, but it worked like a charm! And I AM a huge fan of the Outdoor Magic Erasers. I’m going to start just buying those from now on. They seem to be much stronger than the indoor ones and don’t flake off as much. You can buy them at Lowes. Below you can see how nicely my door cleaned up. 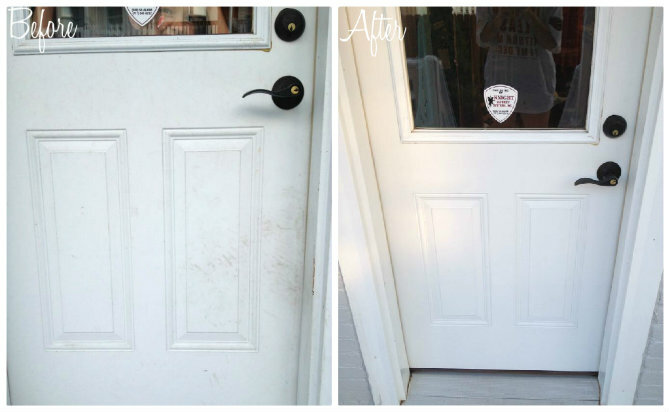 It’s hard to see but in the before there is actually reddish deck stain on the right side of the door jam. The magic eraser took the stain right off! Here are some of the other Lowes products I bought to complete this project. This was my first time using Valspar’s paint and primer in one. I was actually impressed. I’ve used 2 in 1 paint products before and have always been disappointed but the Valspar outdoor paint covered the red brick nicely. I used a long nap roller for the first coat and then went over the hard-to-get-into grooves with a brush for the second coat. I used the paint mit on all of the spindles and on the porch floor. I still had to touch up with a brush but I liked the mit. I had purchased the shutters a few years ago at a yard sale. They were coated with over 100 years of paint and were a mess. I did my best to remove the old paint using Jasco Paint & Epoxy Remover but it was proving to be a TON of work and just not worth it. In the end, I just spray painted over the chippy paint and called it a day :). I think they turned out beautifully, chippy paint and all! 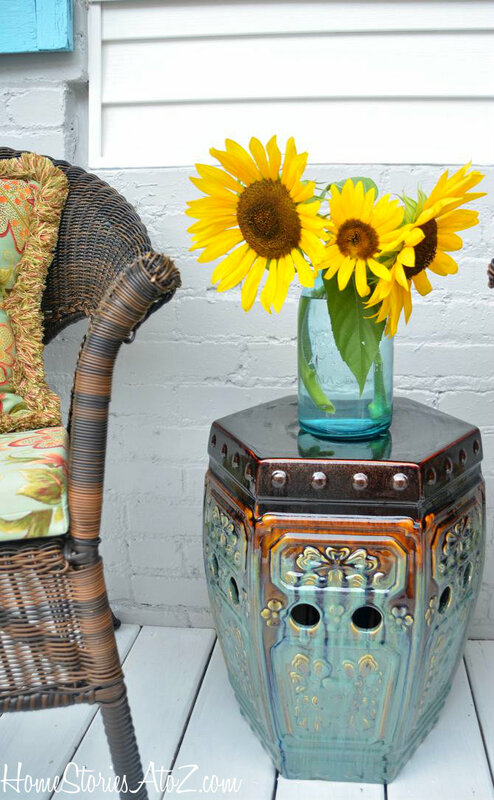 The porch furniture, garden stool, and subway art are all from Pier 1. The paint color is color matched “Knitting Needles” by Sherwin Williams. This fall we’re having the entire exterior of our home repainted and Knitting Needles is a strong contender. The sunflowers are from my garden! When Zephan was in Pre-K he brought home a sunflower seedling for Mother’s Day. It grew into one sunflower. I saved the seeds and replanted them this year and they went CRA-ZAY! I wish we had a yard larger than a postage stamp so that I could have planted even more. LOVE! The rocking chair was a $10 Craigslist score. I need to figure out if I want to paint it, stain it, or leave it as is. For now, I’m enjoying it as is! So there you have it! Now when I sip a drink from my patio table I can look back and see this delightful sight! 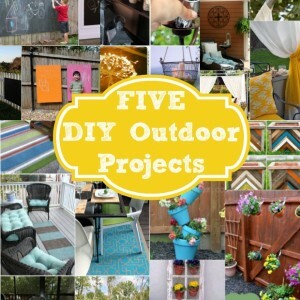 Disclosure: Lowe’s provided me with a gift card and P&G cleaning products to showcase this project this month as part of their Lowe’s Creative ideas Bloggers team. Love it, Beth! What a difference! So fun…..
Beautiful makeover! The transformation is breathtaking. Congratulations on a job thoroughly well done!!! I love those blue shutters! They look so incredible out there! Great job! 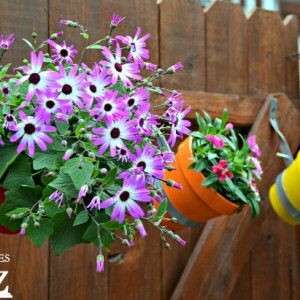 I love the blue pots, how did you make it? Your porch is awesome!!! Thanks for sharing it! 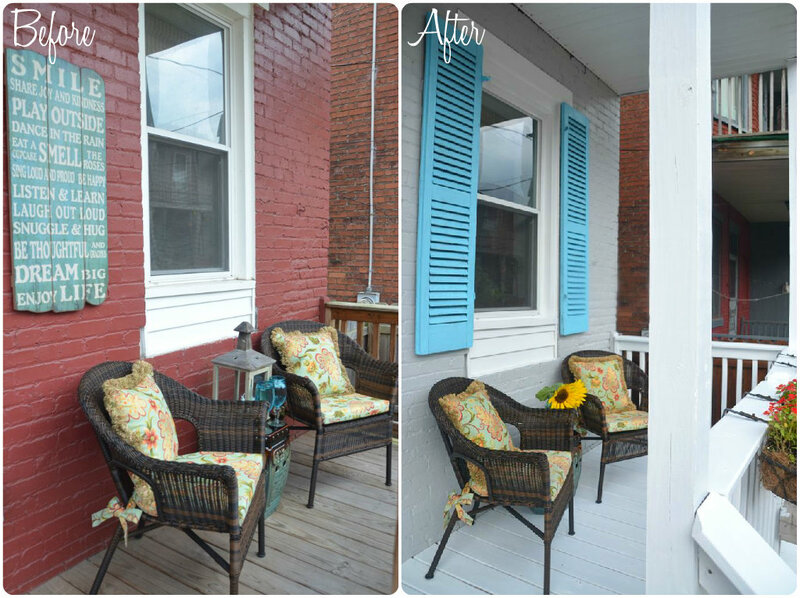 what a wonderful porch redo!! mine is in dire need!! Beth, I love the porch! One of my favorite things is Zephan’s pre-k sunflower going crazy this year! It looks great – so nice and clean and fresh. I love it!!! It’s so much fresher and brighter now! The light blue accents are perfect against the white! I’ve heard over and over those magic erasers are worth the money, but I have yet to try them… Definitely on my list now!!! 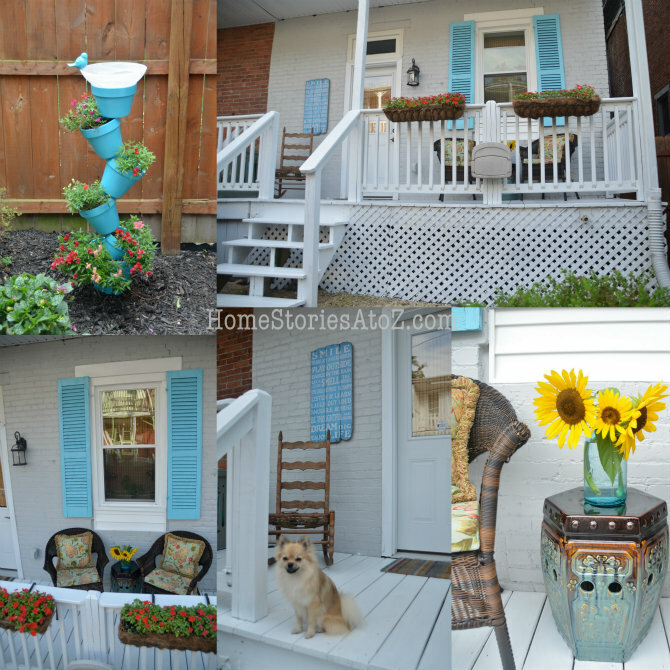 Everything looks so super fresh….I am partial to blue so love the shutters and love that stack of clay pots painted blue! All your hard work paid off. Just fabulous! Wow, what a difference a little color makes! LOVE your choice! Gorgeous!! I LOVE that color!!! Beautiful- I love the color combo! WOW! Great front porch and improvement over what was pretty great before! What a beautiful job, I love the porch!! Beautiful! I love the new colors! Beth, it’s beautiful!! Great job! I would love to win! I have a deck that is only 3 years old, but looks 10 years old! It definitely needs help! Thanks! Love the porch :)Thanks for the giveaway! 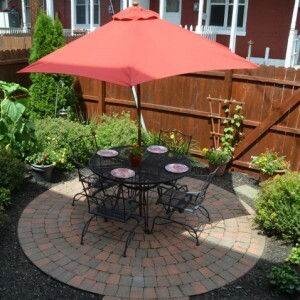 Your back porch looks Great-Enjoy! cute porch! I love the color you painted the shutters! I love your porch. It came out beautiful. Wish so bad I had one to decorate. Hey Beth, that porch looks terrific – a totally cool and relaxing place to sip coffee or just relax. But, boy, that is A LOT of work – you must be both wiped out and totally pleased! Congrats again – it looks great – now go out there and enjoy! Hi Beth: What a beautiful new porch! Amazing what a change it was to go from red to white bricks–love it! And all the decorative accents–the pillows, the garden pot decoration with the bird on top, and the side table–are really pretty. Your porch looks great! I love the cheery blue and the sunflowers just finish the space so perfectly! LOVE the shutter color! Nice work! Looks great and thanks for the giveaway. I love your front porch makeover! It is so pretty and refreshing! I am in the process of trying to purchase a fixer upper. This gift card would be put to great use! Oh man, that sounds like a lot of work, but you’re right – it was worth it! The space looks inviting and has me longing for a back porch. Thanks for the work you do on your blog. It’s so helpful! Your porch looks so fresh! Great job, Beth!! Many thanks for the chance to win. It sounds like a tremendous amount of work but it turned out beautifully. Definitely worth it! The colors you chose are perfect for it. Your porch looks amazing!! So inviting and relaxing. Did not know about the Mr. Clean products. Thanks for sharing your beautiful porch. I love the new look. 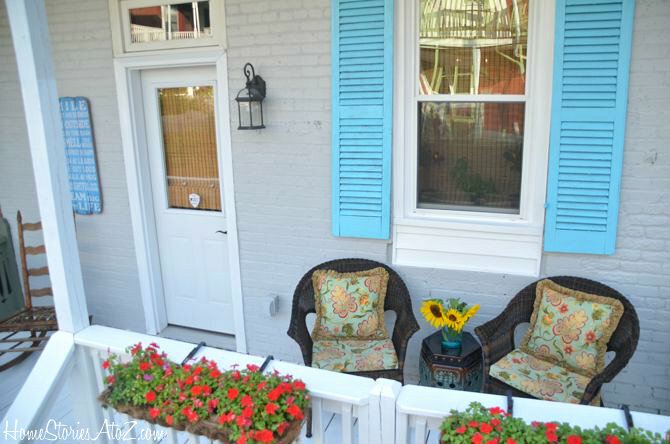 I am looking for some shutters to make a new look on my porch. The blue is charming and it makes it pop! Love the porch! Especially love the yellow sunflowers against the gorgeous blue shutters! love the pics! thanks for the giveaway! I love the bold, unexpected color of the shutters! Looks great! I need to redo my back porch! The back porch looks great! I love Magic Eraser’s and had no idea there was an outdoor version! I am definitely trying those out soon. This looks beautiful!!! I just bought a house and could really use the prizes! Beautiful. Wow, a lot of painting went into that but totally worth it. 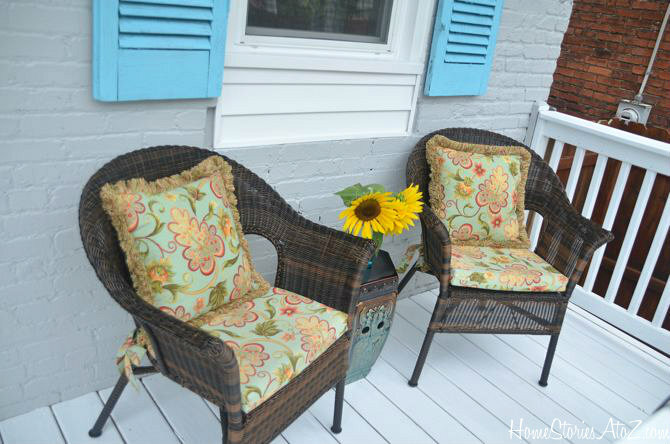 Nice Beachy vibe to your porch! Your porch area turned out great! Thanks so much for the tip about the Outdoor Magic Erasers, I use the indoor ones all the time but they don’t last very long. Will go to Lowe’s this week to pick up some of the Outdoor ones. Your completed back porch looks awesome! I think the shutters really do make the space. I wouldn’t worry about the ‘chippy-ness’ – It just adds character! One more time- your back porch is beautiful!!! 🙂 I love the colors and I can only imagine how much work you put into it. I’m kinda’ glad I can only imagine…. 😉 Too bad our neighborhood HOA forces us to be mindless clones with our exteriors. Gotta bookmark this post, though I dread the thought of using it! Hopefully it’ll cool down in South Carolina soon so I can put it to use. I love the older feel of the shutters! It gives the porch a pop! Also would love to win the giveaway! Love the color of the shutters! Looks great! Looks so summery! You’ve done a great job! I love the porch redo. Your neighbors must be totally envious! The colors are so relaxing and inviting. Great job! LOVE IT!!! I love Mr Clean Magic erasers and didn’t even know they made outdoor ones!!! They regular ones are great for cleaning vinyl baby dolls! I just went through a whole “I love Majic Sponges” with my sister in law this weekend. She had never tried them (she doesn’t have kids is the only excuse I can think of) so I ran to Lowes and bought her some. She was amazed and she and her friend who was also there were converted after one door rubdown. Great stuff. Love the colors on the porch. Nice job. I need to get the old shutters out of the garage and paint them a fun color. Thanks for sharing . It all looks great and I love the rocking chair as is! 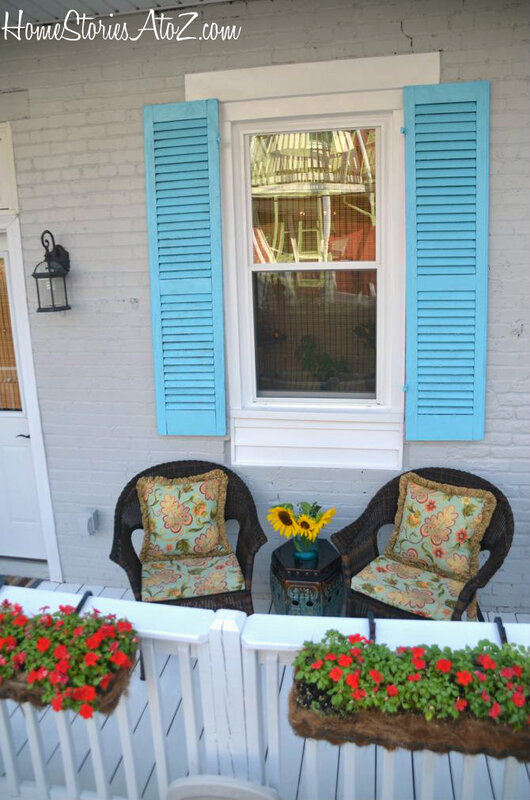 Love the color of the shutters, Beth! And the pillows go perfect with them. Thanks for the giveaway! Looks soo good! Looks fantastic! I love Mr. Clean products! 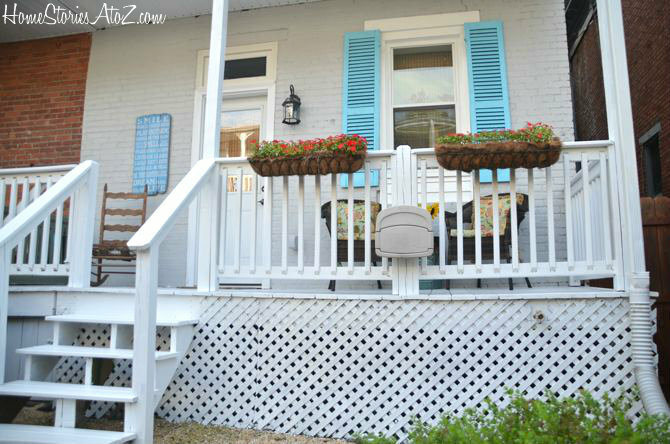 Looks really pretty with the blues…I have porch envy! 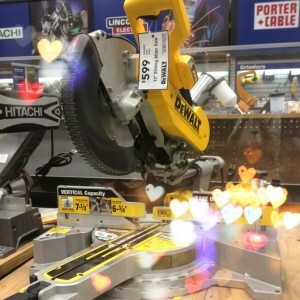 Your makeover is great! I’m getting ready to re-do our master bedroom soon and a $100 gift card from Lowe’s is just what I need!! Love what you did with the place, looks great. Love the color choice. I would love to use something that bright on my screen porch! I love the colors you chose- very peaceful. I love the shutters! Can’t wait to do the same thing to my own home. gorgeous porch! thank you for the giveaway! Your porch is so pretty! Turned out great! Sorry you had to paint so much. Very inviting.. makes me want to sit an chat while. Sadly many good things take hard work. It looks amazing! A great giveaway…I’d LOVE to try the magic erasers!! Your hard work was so worth it! Love the shutters and the gray paint on the brick! 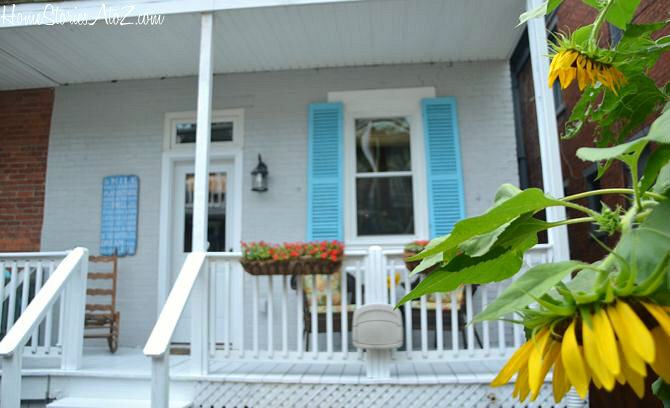 I just love that blue color (shutters and planter). I’ve got to find somewhere to use it in my house! So cheery! Can’t wait to redo ours! So many things that I would love and you have a fabulous porch that makes me wish I had one of them. LOVE those colors and the craigslist chair is a great find!! Your porch looks great! I love the pops of turquoise and I DIE for that rocking chair!! I am a new blogger and love you r designs. I have been following you and have been inspired by your creativity and all around good ideas! Thanks for your constant inspiration! It looks beautiful! I love how you tied in the color of the shutters with the wall art and planter!! 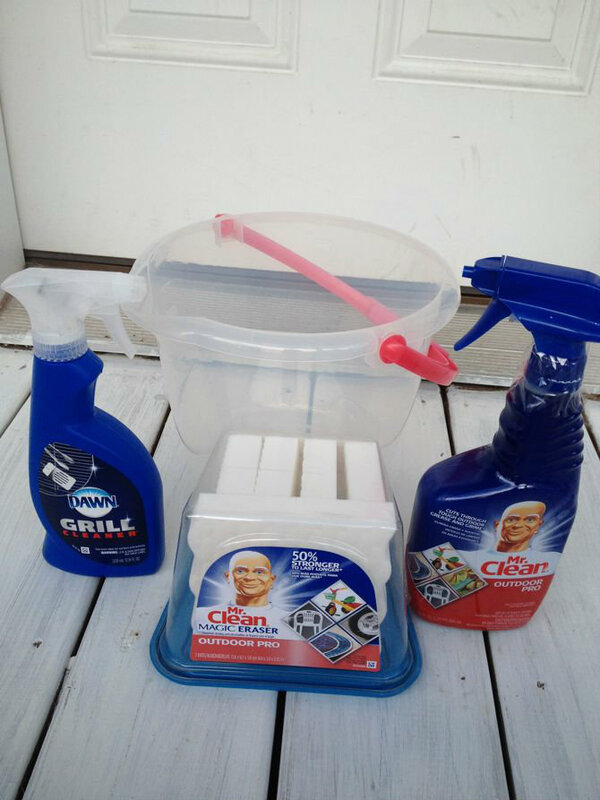 I’ve been itching to try the Mr Clean outdoor products, so thanks for hosting! Love the colors you used – so cheerful. Good on ya for attacking outdoor brick – it is TEDIOUS! The end result was worth it, though – turned out great! I love the blue POP of color! This is so cute!!!! 🙂 Great job! Love it! Thanks for the give away. Your porch looks so pretty. You’ve certainly done a lot of work on it. Thanks for the inspiration! Lovin’ what you did. You did a great job on your porch! I LOVE it! It looks so beautiful and cheery! Love the color for the shutters! I’m putting these erasers on my list for the next lowe’s trip. our dog has dirtied up the interior and exterior doors at our house. Maybe those will help. fantastic results!!! your project turned out beautifully!! Porch looks great! Love that sky blue against the gray. It looks great, that is a lot of painting though! I bet you are worn out. Wow! I think the shutters look amazing…they really pop! I bet the chippy paint gives them some character. You did a great job! It looks fantastic! I love all the colors! Pier 1 girl. Go see if they still have it! We’re getting ready to start a remodel project and a gift card would be a huge help! I also need to try the Outdoor magic erasers! I love using them to clean everything!!! Looks so fresh and so clean! What a great before and after. Enjoy!! I would love to do something like this to my back porch and that gift card would get the supplies! 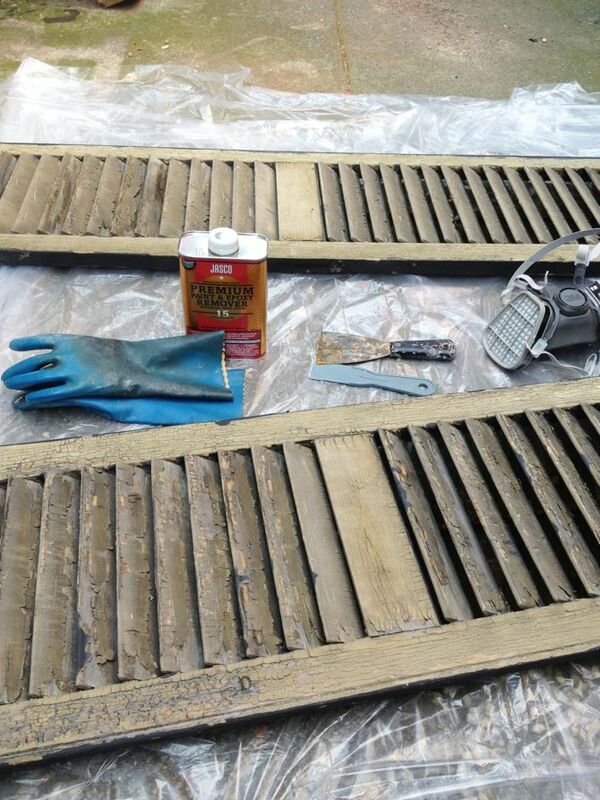 Your porch looks great! Thank you for the giveaway! It looks really good, Beth! I really like the gray and blue together. Way to go Tricia :)! We’re just getting started on a huge project so this gift card would be a huge help!! You did a great job! Your porch looks relaxing and inviting. You’re one talented girl. I love it! Whoo hoo! The porch furniture is very cute! It looks great! You deserve to sit and sip ice tea…that was alot of work you did! I never knew about the outdoor Mr Clean product. I’ll have to try them. They really do work well and I’m now a convert to the outdoor erasers. I think they should just make their indoor erasers with the same durability. I love those chippy looking shutters & the color is awesome. Thanks for the giveaway. I looks great, Beth!! I love the pops of color! 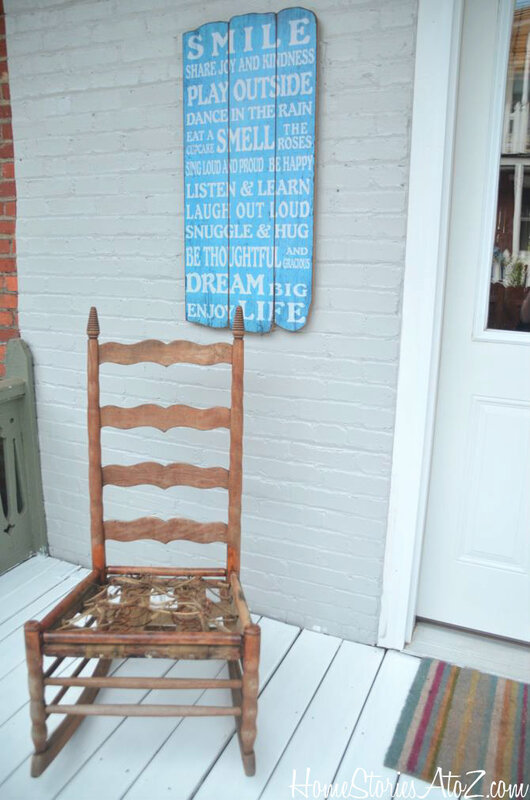 the porch looks great….now i need to start working on mine!!! Love the shutters! And the sunflowers! Your deck came out great, Beth! 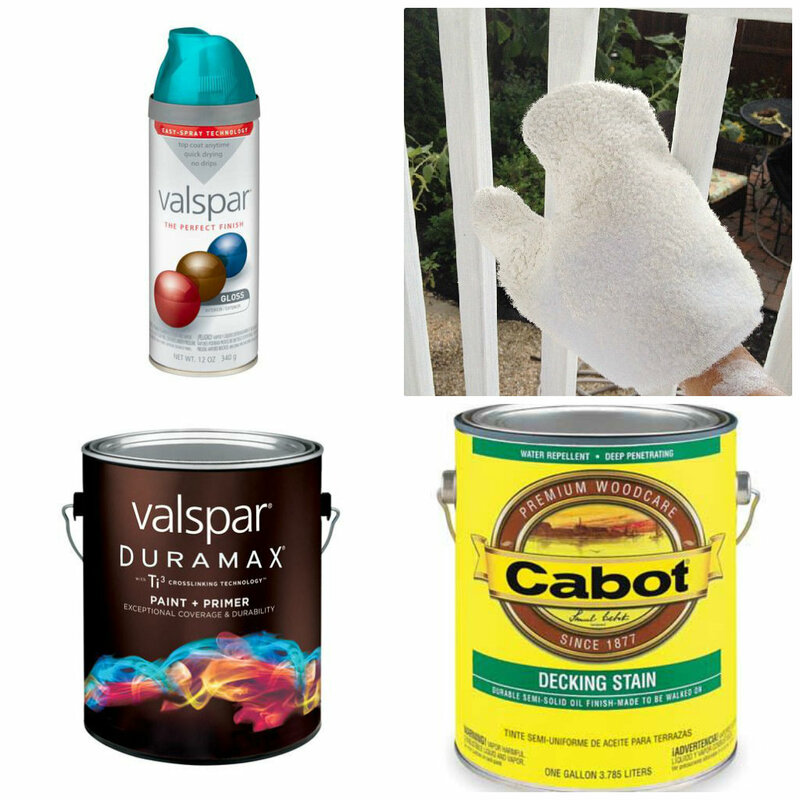 I am so intrigued with that paint mitt as I embark on painting my deck this week. I’ll have to look one! Thanks for the tips! I love your fun blue that you chose. I recently painted something in my garden “spa blue” and it is similar. Enjoy the outdoors! Great Job. Oh my goodness Beth, I just love it! Such a beautiful space to relax in. The colors you used are just perfect! LOVE the color of the shutters and the garden stool. Fyi- you can plant 2 rows of sunflowers and tie the tops together to make a shaded play are for your little, if your yard allows. LOL Also, I have never heard of a paint mitt! How does that work, and was it easier than a brush? Great remodel job!! Good tip Anna! The paint mit worked well but I still had to go back and touch up with a brush. I think it’s a matter of tool preference really but I would use one again. The new paint color on the house makes the biggest difference! Love the choice of turquoise as an accent. The deck really looks lovely! 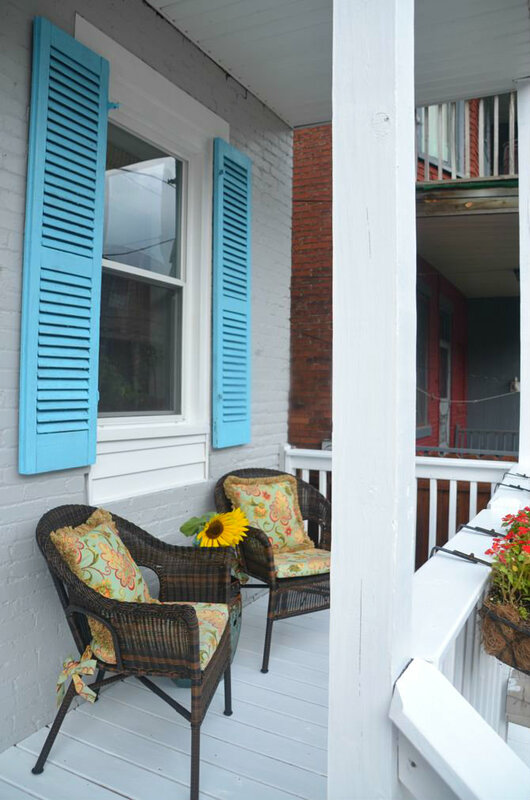 Your porch looks great – and I love the addition of the shutters. Very cool! My patio needs major work too! Dumb. So dumb. I was standing on the very top of a 6ft ladder to get some of the shots. Looks so bright and fresh! oh man, i have major painted brick envy! love the pops of blues back there! Gorgeous – I love the color of the shutters! Oh girl, it was awful but worth it in the end!